The PolyScience MM7 Recirculating Chiller provides you with powerful centrifugal circulation and a controlled range of temperatures. This immersion chiller is an ideal alternative to tap water cooling with precise digital control and a stability of ±0.1° C and a working range of between -5° to 50°C (23° to 122°F) This microprocessor controlled, digital circulating chiller has a modern refrigeration system, with a compressor that’s built to last for years, a magnetic drive centrifugal pump that’s requires little maintenance. The upfront controls of this benchtop chiller and bright digital display allows users to quickly and easily set their parameters including alarms set points, and reports back actual temperature and fluid level. 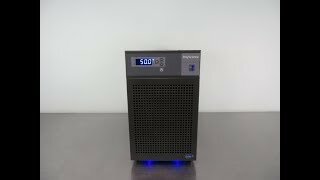 This PolyScience MM7 Recirculating Chiller has been fully inspected and comes with a clean bill of health. All of our lab equipment comes backed with our standard warranty. Should you have any questions, please don't hesitate to contact us.